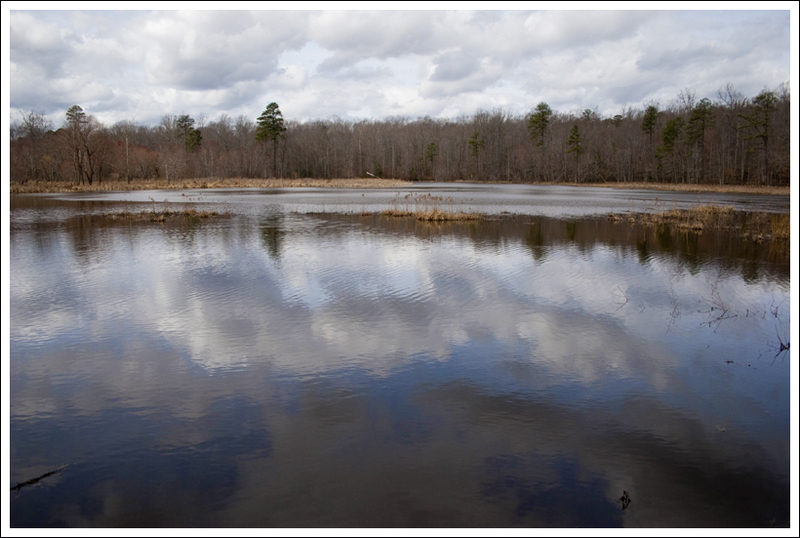 The Beaver Lake trail is a 2.5 mile loop around a 24 acre (and shrinking) lake in Pocahontas State Park. Reflections on Beaver Lake. 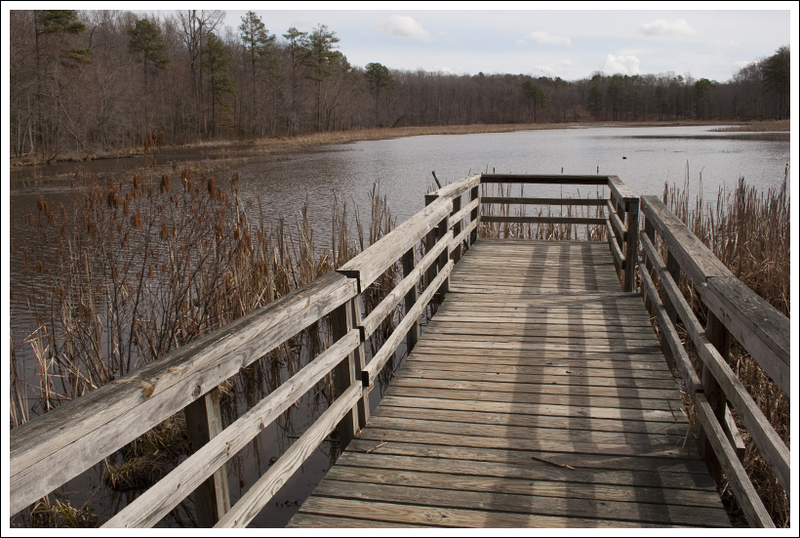 Below: Some of the trail around the lake is traversed by boardwalks; Two docks overlook the lake; a shallow stream feeds the lake. We happened to be in Richmond for the CAA Men’s Basketball Tournament (JMU lost in the first round – Boooooooo!) last weekend. Since we had some free time on Saturday morning, we headed over to Pocahontas State Park for a short leg-stretcher hike. 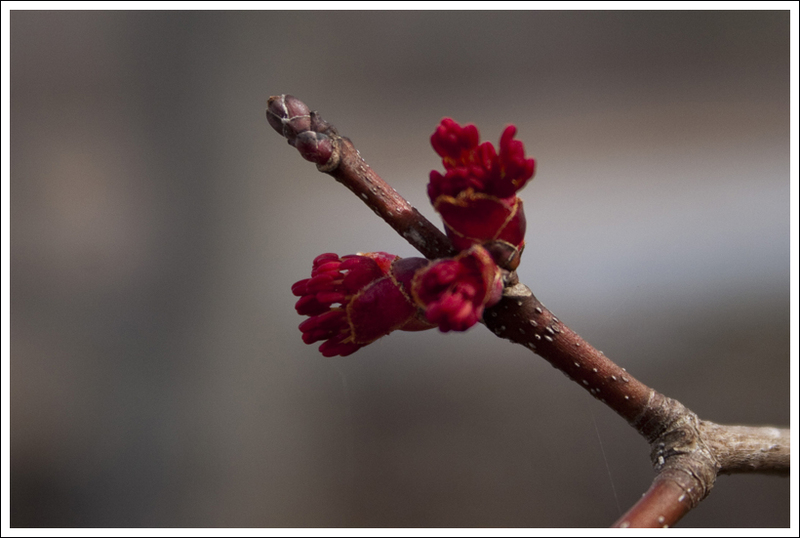 It was a warm, but cloudy, day – spring is definitely in the air. On our way to the park, we even saw some cherry trees starting to flower. I was surprised by how big Pocahontas State Park is – especially so close to Richmond. As it turns out, Pocahontas is actually Virginia’s largest state park. After paying our $5.00 parking fee, we headed over to the CCC Museum and Nature Center area, where our trail began. 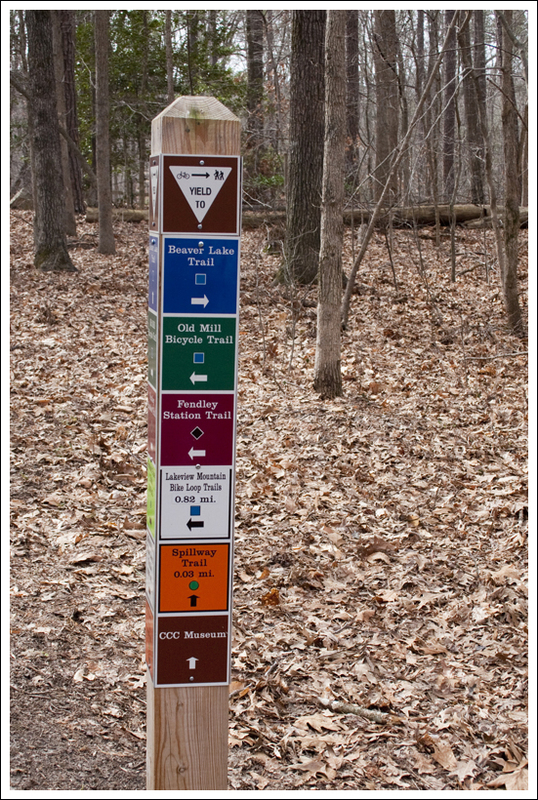 The hike traces the perimeter of Beaver Lake, using a series of gentle paths and boardwalks. We followed the trail counterclockwise. The near side of the path was relatively flat, while the far side climbed up a small ridge and followed a series of easy ups and downs. 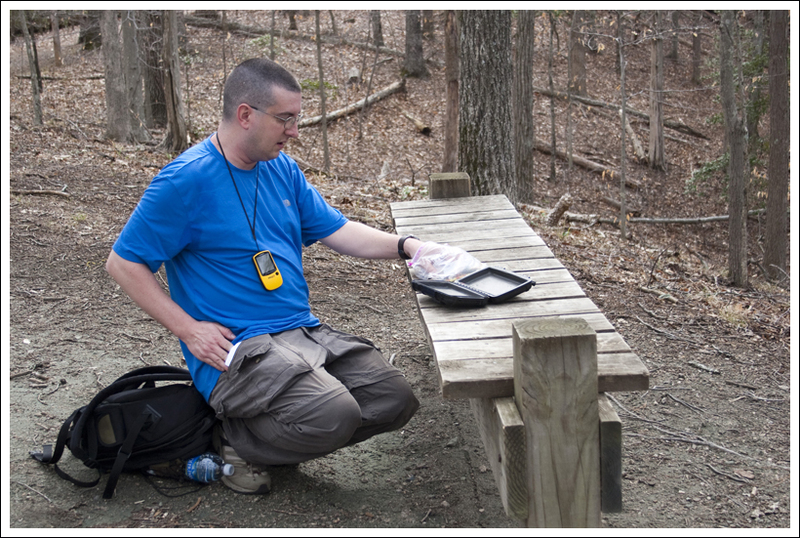 Adam finds a geocache. 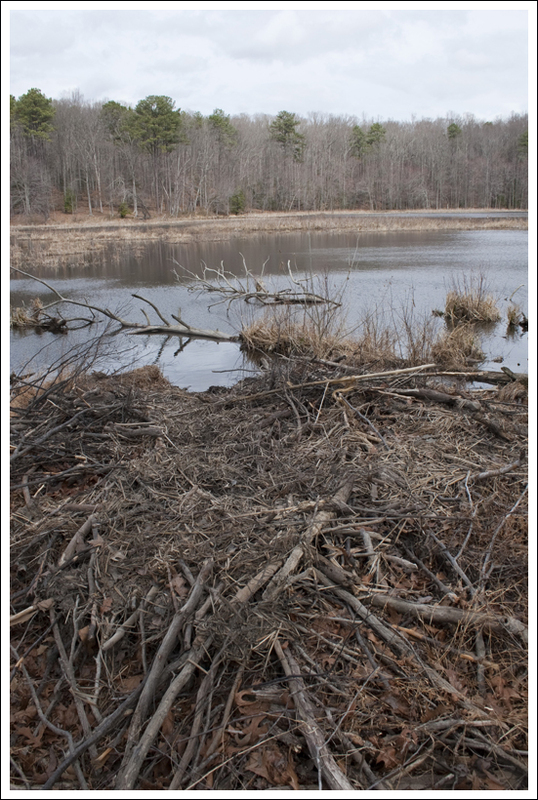 Below: Trails in the park are clearly marked; Fallen trees have been carved into chairs; An abandoned beaver dam. Beaver Lake is slowly being consumed by the landscape around. 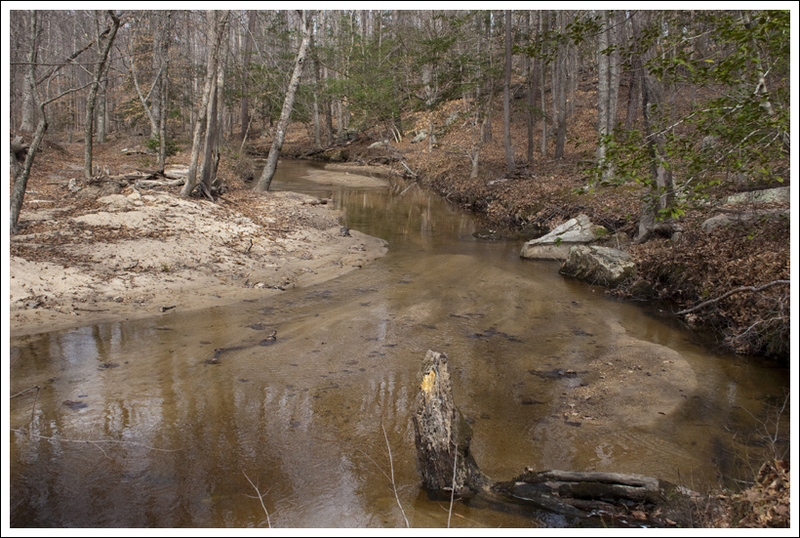 Erosion and plants are reclaiming the water, and turning the area into a freshwater marsh. There wasn’t much growing when we visited, but in the spring and summer, the area is covered with water lilies, cattails, and other aquatic plants. We saw a few buffleheads on the water, but they were too far off to get a decent photo. We also saw evidence of beavers – an old dam and lots of gnawed trees. Though, I doubt any beavers still live in the lake. It’s probably too shallow. 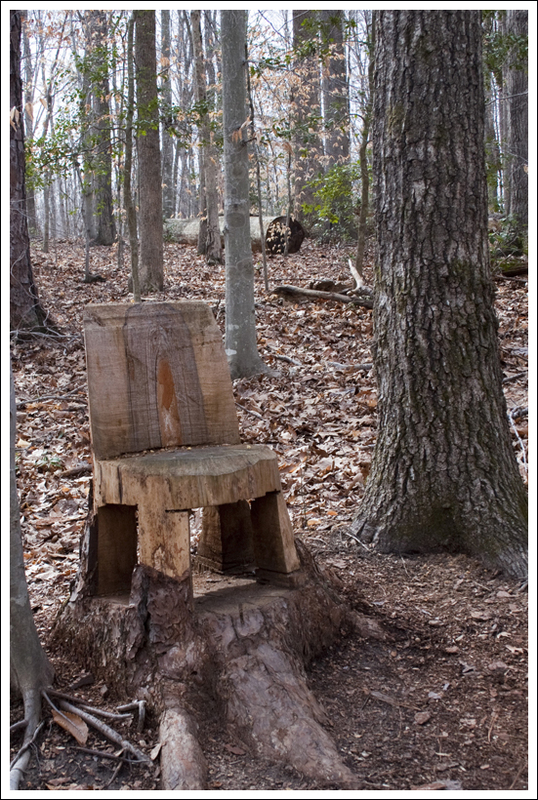 One of the things I really liked along the trail were the tree stumps that had been sawed into chairs. What a clever way to make use of a fallen tree! The hike was short and easy, so we were done within the hour. I’m really looking forward to nicer weather, longer hikes and hopefully several overnight backpacking trips. On the way back to the hotel, we even got the chance to stop by REI! That was a real treat for us because we only have one very small outdoor store in our area. We were able to pick up some new backpacking gadgets and I got a new pair of hiking shoes. I can’t wait to try them out! When we were thinking about checking out the CAA Men’s Basketball Tournament, I suggested that we try to find a hike in the area. I had been a few years ago to Pocahontas State Park and thought it would be a great place to start. It is great that Richmond has a nice park just about 20 minutes away in Chester, VA. This park is quite popular with people trying to get outdoors without having to drive too far. This park is definitely a multi-use area. 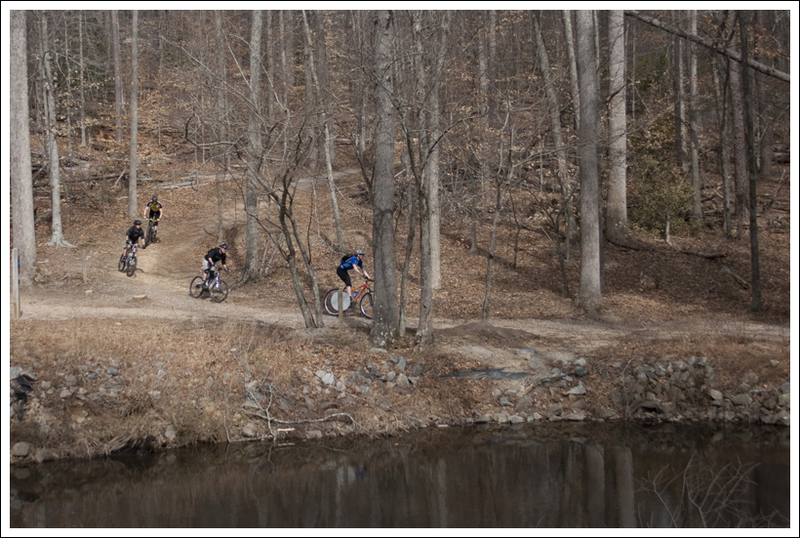 We saw lots of mountain bikers through the park and we saw several trail runners on the Beaver Lake Trail. The footing is perfect for trail running and only has a few hills, making it great exercise or cross-country training. 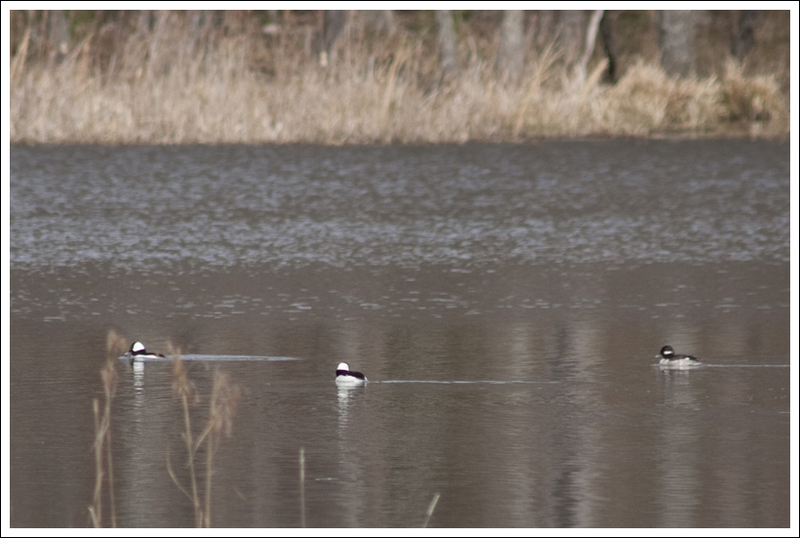 Buffleheads on the lake. 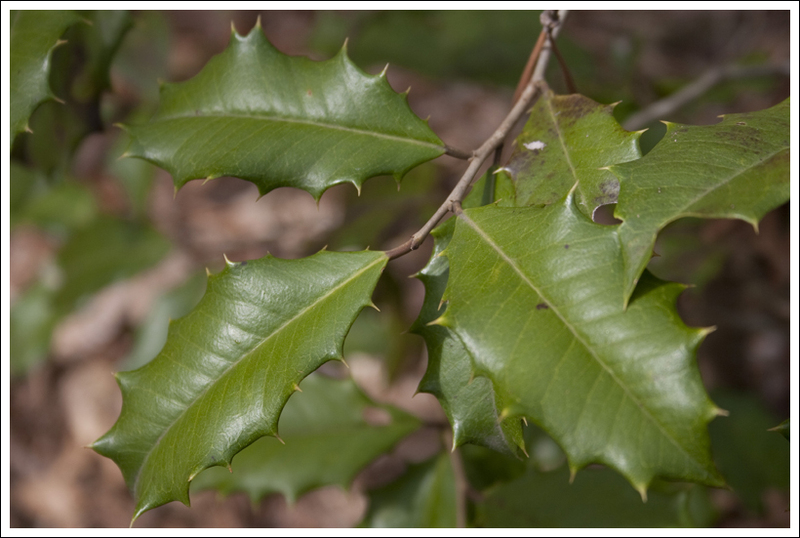 Below: The park has a lot of holly growing; The first buds of spring; The trails are popular with bikers. We parked at the nature center and found the signs for the blue-blazed Beaver Lake trail. The trail passed by an old furnace and then descended until you reach the lake. At the lake, there is a nice pier to view the water and do some birdwatching. We then took the trail counter-clockwise, which went around the lake. During most of the beginning of the trail, the lake was in view. We were serenaded by frogs in the lake, which reminded us both of the sounds of didgeridoos. Along this northern part of the lake, there are a couple of places to get close-up views of the lake. After about .75 miles, the lake shows evidence of being shrunk from what it once was as a boardwalk leads you across the swampy, marshy remains of the lake. I can only imagine the mosquitoes along the marsh during the summer. After reaching the halfway point, the trail begins to climb up the hillside, being rather steep in some sections. The trail winds around and crosses a small stream at 1.5 miles. The trail then climbs up the hillside until views of the lake are seen again around 1.75 miles. You will then descend for a short distance and continue the trail walking along the southern side of the lake. Around 2.1 miles, you will come to a nice view of a dam at the lake. After crossing the bridge at the bottom of the dam, you will take a short ascent. You can either make your way back to the pier at this point or take the orange-blazed spillway trail back up, passing by the CCC museum, before reaching your vehicle. There is a dam and spillway at the end of the lake. I enjoyed our trip to Pocahontas State Park. If you’re ever in the area and want a decent leg-stretcher, try out the Beaver Lake Trail. Difficulty – 1.5. There are several easy climbs on the ridge side of the lake. Trail Conditions – 4. 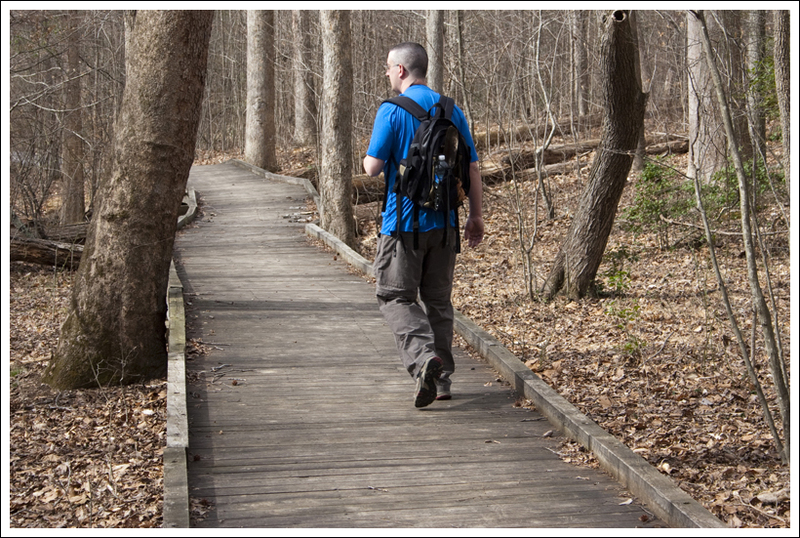 The trail is very well-maintained and easy to walk on. Views – 3 The lake views were lovely. Waterfalls/streams – 3. 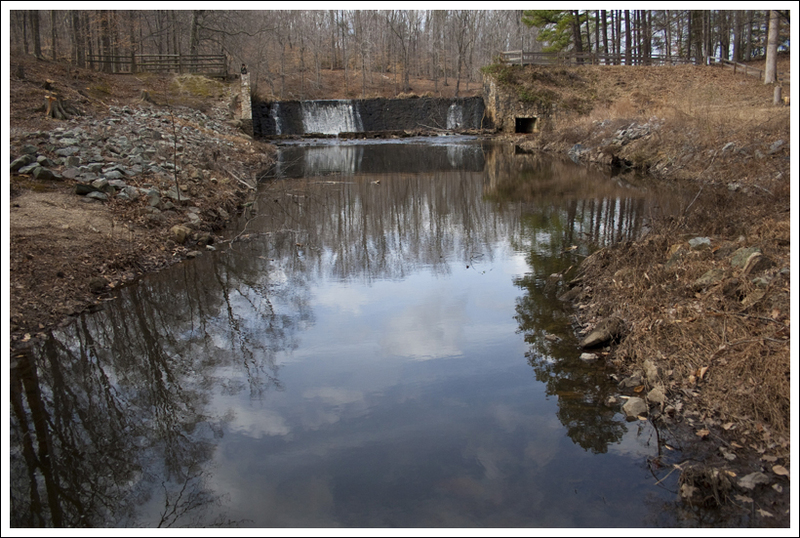 The stream through the woods was pretty and the dam creates a nice waterfall at the end of the lake. Wildlife – 3. This seems to be a good place to see water birds. Ease to Navigate –5. The trail is a well-marked loop. Solitude –1. This park is located next to densely populated Richmond. We saw lots of trail runners, hikers, bikers and dog-walkers. Directions to trailhead: From Route 10/Iron Bridge Road in Chester, VA turn on to Beach Road/State Route 655 (near shopping center). Continue on this road following the signs for Pocahontas State Park. Enter the main entrance on State Park Road. Pay the parking fee ($5 on weekends) and park at the nature center. You should be able to start seeing signs from the parking lot to the Beaver Lake Trail.